To manage your materials and chemical components data, and to comply with your Federal, state and local Tier reporting requirements, consider the following MIRS solutions: SARA module, LOCAL module, CLE module, INVENTORY module. By Porewater Solutions (PWS) based in Ottawa, ONTARIO (CANADA). TRP offers comprehensive planning services and systems that satisfy OPA 90 requirements for oil and gas, refining, manufacturing, pipeline, utilities, chemical, and other industries. Additional services include design and facilitation of exercises to satisfy regulatory requirements. By ToxPlanet based in Cornelius, NORTH CAROLINA (USA). A new vehicle mount allows Maptek I-Site laser scanners to be mounted and transported on common site survey vehicles, saving time and improving safety. By MAPTEK based in Glenside, AUSTRALIA. 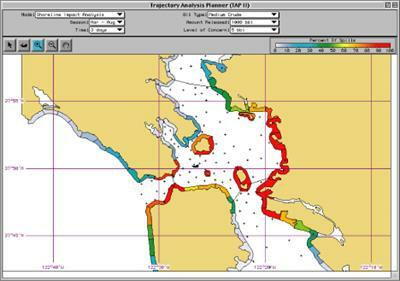 Trajectory Analysis Planner (TAP) is a software tool designed to help answer the crucial question in any Area Contingency Plan: How do I develop a plan that protects my area against likely oil spills? By NOAA`s Office of Response and Restoration based in Silver Spring, MARYLAND (USA). OILMAPLAND is a land and surface water spill model system for simulating oil and chemical releases from pipelines and storage facilities. OILMAPLAND fills the need for a numerical modeling tool for oil and chemical spills that occur on land and then migrate to streams and lakes.